Although Marvelous Fun and Games doesn't technically fall within the purview of Stripper's Guide (our bylaws, written by yours truly, exempt me from tracking activity features), two things make me give this one admittance onto our exclusive premises. First, it is a Marvel Comics production, and so therefore of presumed interest to many collectors, and second, because this feature was created by Owen McCarron, a native and favorite son of Nova Scotia Canada, my newly adopted home. McCarron produced puzzles for the Halifax Chronicle-Herald, and also did quite a bit of comic book work, often for Marvel Comics. 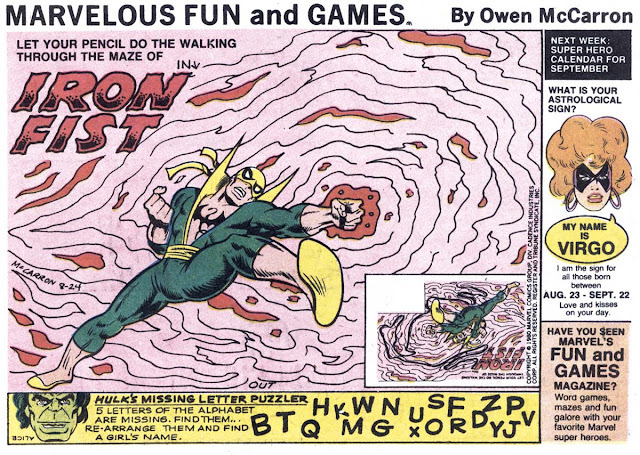 McCarron was pals with Stan Lee, and talked him into the idea of combining his puzzle mania with Marvel's characters. The results would become the syndicated Sunday series Marvelous Fun and Games and the comic book series Marvel Fun and Games. Not being a Marvel comics expert, I don't know if McCarron drew all the material for these features or if a lot of it came from model sheets. If McCarron produced it all, I have to say he was astoundingly good at staying 'on-model' for everyone in Marvel's cast of thousands. The puzzles and games in the feature were somewhat pedestrian, but they were obviously intended for a pretty young audience and were simplified to fit that demographic. 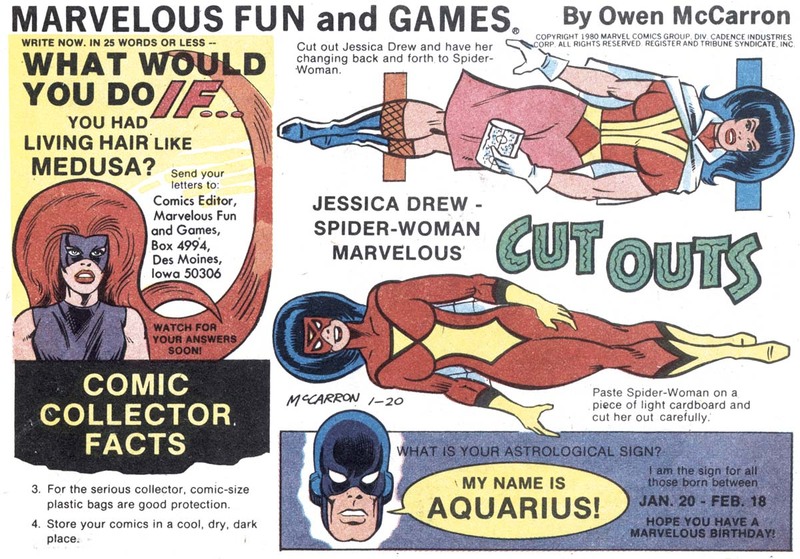 Marvelous Fun and Games was syndicated by Register & Tribune Syndicate to a fairly modest number of client newspapers. It debuted on September 10 1978*, and ended on November 16 1980* -- an end date that is pretty well certain because it literally has "FINAL WEEK" lettered on it! Man, I loved Owen McCarron's stuff. It was obvious he was an artist who really knew puzzles and Marvel history in equal measure, and as a big fan of both I was very impressed with his work. 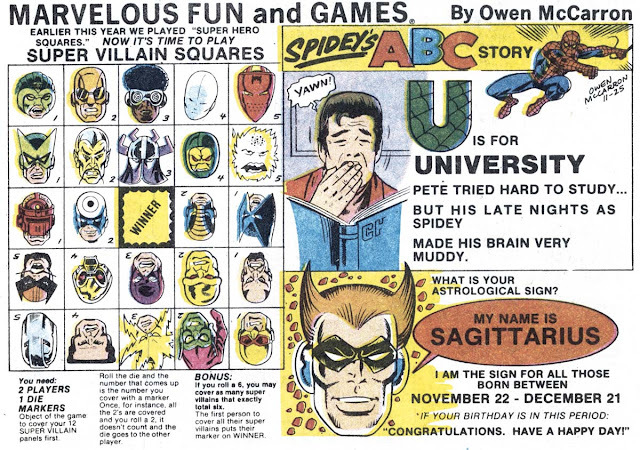 There were also a number of activity books of his Marvel puzzles which are a terrific find if you can locate them. It's a shame Owen's no longer with us. Yeah, this looks like all Owen's work. He was very good at what he did.